Caturday #3: One Month With Cats. 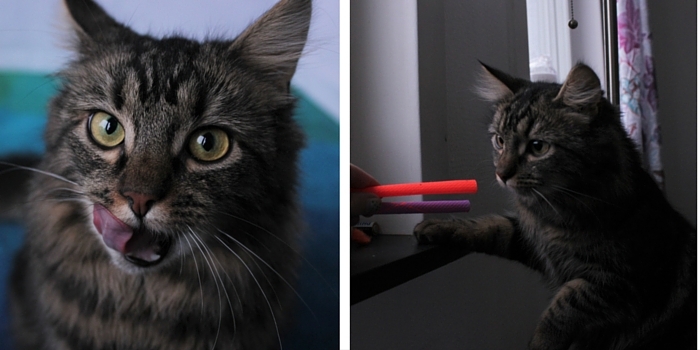 Today it has been exactly one month since our cats moved in with us. They are still getting used to us, just as we are still getting used to having two new furry roommates. We are still not allowed to pet them, but they have started to hang out around us a lot more for the past week or so. They have their favorite toys and candy that I will show you below. And they understand that we are bosses over the food so whenever someone opens the fridge they will come lurking, unless they’re not already lying under the table on a look out. And after one month with cats we humans have learned not to leave any kind of food out and that windows sills are made for sitting and not for flowers. This is Nelli. She is one of the absolute cutest and most photogenic things I’ve ever had in front of my camera. For real. I just wish she would be still for a little longer than one second at the time. And this is Tee. 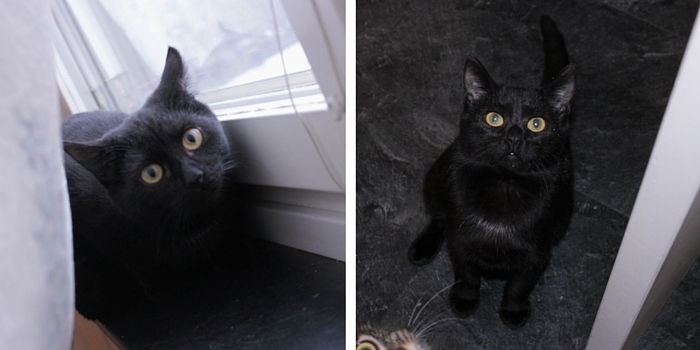 She is seriously the queen of derp faces, which you can see in the second picture. And not only in front of the camera, sometimes she also does them when we’re trying to talk to her. But she is still a real cutie. The purple and orange things at the to of the picture are these really light things that you can press together between your fingers and then shoot it away. Nelli loves them and makes a really loud humming sound when she gets one to play with. She does the same sound when she gets something tasty to eat. The other toy is a mouse that contains honeysuckle instead of catnip. They are both playing with this one from time to time, while Nelli don’t really plays with any other mice. Tees absolute favorite toy is bouncing balls and it’s normally the sound of them that wakes me up in the mornings. But I couldn’t find any for the picture so I guess they are all under the sofa. 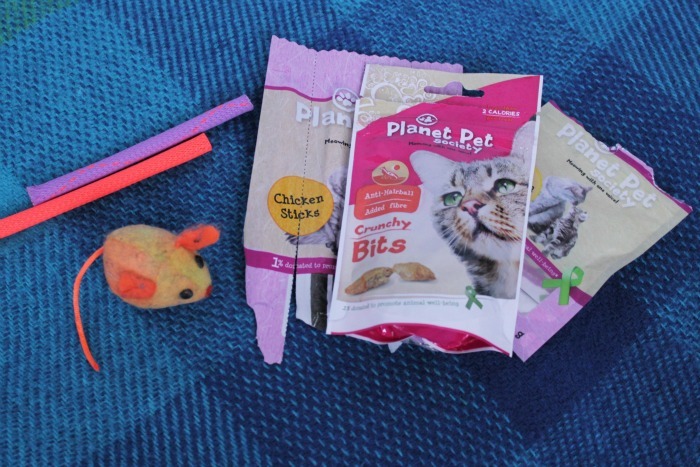 The candy comes from a company that is called Planet Pet Society. We love this brand because a lot of the candies are made from 100% dried meat. The cats loves it too so if you have cats I would really recommend that you try it. Does your cats have any favorites that we should try out? Silky’s favourite you is a bear on string, but she also love chasing a ping-pong ball around the house. Leo has a bird on a string and he likes to try to “kill” a toy mouse. Of course, a cardboard box will be taken over the moment it enters the house! We have a really bid cardboard box that the cats are doing their best to tear appart one piece at the time. Yeah Nelli also tend to find things that isn’t really toys to play with, like pens and dead flowers.